I've been a bit hesitant to post about this topic, because well, I have a lot of side business ideas, even full business ideas, that never happen. I mean for them to take off but I get distracted. I'm often like an ADD kid in a toy store. Since this last December, I have been toying around with the idea of starting a Kawaii store -- both online and at a physical location in Wichita. To open a physical store is quite a big leap and requires leaving my job, making myself 100% committed towards building the best business that I can. And to be honest, I don't even know if people in Wichita would really shop at a Kawaii store. It's one thing for the girls and I to be into all of this, but would other people in Wichita be as interested? So before I take any drastic steps, I have been taking a series of baby steps towards the goal of a store. My work thus far has been focused on where I can purchase from wholesale and determining what kinds of products I would want to carry. As you've probably noticed, my girls and I are a little nuts about Japanese candy... so that's a given. Japanese snacks are included as well. Next is Sanrio and San-X products including stationary, bento supplies, plushes, squishies, etc. There are some other licensed products I am still exploring including some of the Manga and Anime stuff as I think that could draw in more business as well. The next step that I am moving towards is the online store. It has smaller risk and I can run it while still working full time. One of the concepts of the online store is the idea of a Kawaii gift basket. I think a gift basket full of Hello Kitty and Japanese candy is just the kind of present I would love to receive (Valentine's Day - heck yes, Birthday - uh-huh, Christmas - wouldn't complain at all), but would other people? I am testing the waters with the basket idea as I think this is something I can build online, which would be the next small step forward. I have just ordered the products for a first basket and am probably going to do an Ebay sale on the first basket to see what kind of interest I get. I've sold quite a bit on Ebay in the past so it would be an easy place to start. The targeted customer base would be US customers as most of the products I would sell are not easily found in the states and thus more desirable. In the next few weeks I should have an update on the basket and a link for those of you that may be interested. It will be full of Japanese candy and have a Rilakkuma theme. 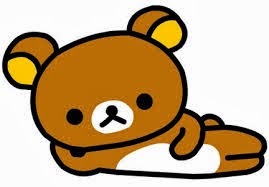 Rilakkuma is a teddy bear character by San-X shown above and very, very popular in Japan. So fingers crossed that I'm able to keep the momentum and others will find value in what I'm selling.